Few things are more frustrating as an educator than reading a trade magazine from a major organization in a particular field and finding a glaring factual error in a how-to article. About a year ago I was reading an article about using maps for navigation in a magazine from a major outdoor organization. It started innocently enough; in the “Tips and Tricks” section the author emphasized the importance of not neglecting map and compass skills in the age of GPS. I wholeheartedly agree with this philosophy since a compass does not require batteries, a display, satellite reception, software, firmware, or any number of technical problems that always seem to plague our electronics at the least opportune time. (See my previous post Maps & Magnets in the GPS World for more on this topic). I had to heave a sigh of frustration, however, at the next paragraph. “Make sure you know the datum you are working with.” So far, so good; this is absolutely true, and can be absolutely critical to finding a specific location. “Is it latitude/longitude? 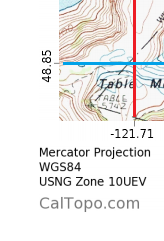 Is it Universal Transverse Mercator?” D’oh! Lat/Long and UTM are not datums; they are coordinate systems. For those who are not familiar, a coordinate system is the naming system we use to measure and locate a position in space or on a graph. The most familiar is the x/y axis of the Cartesian coordinate system we learned in basic geometry. In Latitude and Longitude we essentially lay a graph over the surface of the earth and measure in degrees E or W (x axis) of the Greenwich meridian and North or South (y axis) of the equator. The datum is the mathematical model or baseline reference from which the coordinates are measured, and as precision and more advanced mathematical modeling has progressed, not all maps use the same one. This results in a crucial detail for navigation and search and rescue: one coordinate set (i.e., a lat/long measurement) can represent more than one location. An analogy would be measuring your property for a new driveway. You measured 10ft North and West from your mailbox, but your contractor measured 10ft North and West from the property corner, and now you have a driveway in your bathroom! You have to agree on the same reference point to find the correct location for your driveway. Compare these 2 images. They are the exact same base map. Where the lines cross represents a coordinate. They have the same name (48.85 degrees N, 121.71 degrees W), but are in different locations. While the difference does not appear dramatic, the location discrepancy between datums varies and can be quite substantial (hundreds of meters in some places), with significant hazards or obstacles (avalanche slope, cliff, river) between them. If a rescuer does not know what datum a set of coordinates is based on, he/she cannot know with certainty where the exact location is. To help, here are some rules of thumb: The most common datums in the US are North American Datum 1927 (NAD27), NAD83, and World Geodetic System 1984 (WGS84). NAD83 and WGS84 are virtually identical. If the person giving the coordinates is using Google Maps or something similar, chances are it will be WGS84. Likewise if they are using an app like Geocaching. If it is a USGS topo map, it is likely – but not always – NAD27. If they are reading it off their personal GPS or mapping software (such as Topo!, Garmin, Magellan, etc. ), it could be anything, but in the US is most likely to be one of the three. Fortunately, the datum on GPS units, navigation apps, and mapping software is selectable in the settings. Finding and using this setting is a very simple but critically important part of training with a GPS. 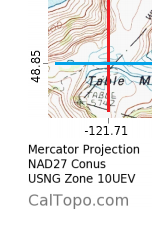 The beauty is that if you have a coordinate in WGS84 on your GPS and need it in NAD27 to draw on your topo map, all you need to do is change the datum and your GPS will give you the same location using a new coordinate referenced to the different datum. This translation is integrated into my GPS navigation training. This entry was posted in Navigation, Outdoor Recreation, Skills, Uncategorized and tagged backcountry, backcountry skills, compass, GPS, maps, Navigation. Bookmark the permalink.